The present work proposes, for the first time, a study exclusively focused on the diversity of Pteridophytes in Togo. The study was based on fieldwork that resulted in 869 new collections gathered between 2013 and 2017 in the country and on yet existing herbarium specimens kept at the Herbaria of Lomé and Paris. Thus, a total number of 1092 specimens collected throughout the country served as a basis for this work, to which were added the known, published occurrences of Pteridophytes for the country. At the end of this study, a total diversity of 134 species belonging to 53 genera and 25 families and 12 orders were recorded and documented for the country. It results in 73 newly cited species for Togolese flora, including 61 spontaneous species. Lycopodiopsida (18 species) and Polypodiopsida (116 species) classes are both represented. The Polypodiales order is the most represented with 97 species. The Pteridaceae and Aspleniaceae families are the most diverse with 24 and 22 species respectively. Finally, notes were provided on species distribution at national level. Much work has been done on the flora of Togo ( Adjossou and Kokou 2009 , Akpagana and Bouchet 1994, Batawila et al. 2005, Brunel et al. 1984, Guyot et al. 1994, Kokou et al. 1999, Kokou et al. 2006, Woegan 2007 ), resulting in flattering numbers of over 4000 species ( SCBD 2018 ) for this relatively small country in tropical West Africa. Nevertheless, most of these works have mostly focused on angiosperms, suggesting an underestimation of other vascular plant lineages (the seed-bearing Gymnosperms and free-sporing 'Pteridophytes') and non vascular lineages ('Bryophytes'). 'Pteridophytes' comprise actually two distinct, non-closely related evolutionary lineages treated as two classes, namely Lycophytes (Lycopodiopsida) and Ferns (Polypodiopsida) with a worldwide diversity estimated at about 11,916 species ( PPGI 2016 ). On the African continent, the diversity of this group is relatively much lower than in the other tropical zones of the world with only 1,441 species ( Roux 2009 ). This lower diversity could be linked, amongst other things, to the adverse past eco-climatic conditions and the weakness of the current forest cover ( Kornas 1993 ), but it is certainly not the result of a single cause Couvreur 2015 . Nevertheless, some regions are more diverse than others due to particular ecological conditions. These are mainly mountainous areas, islands and wet forest areas ( Moran 1995 , Aldasoro et al. 2004, Watkins Jr et al. 2006 ). Thus, the works of Aldasoro et al. 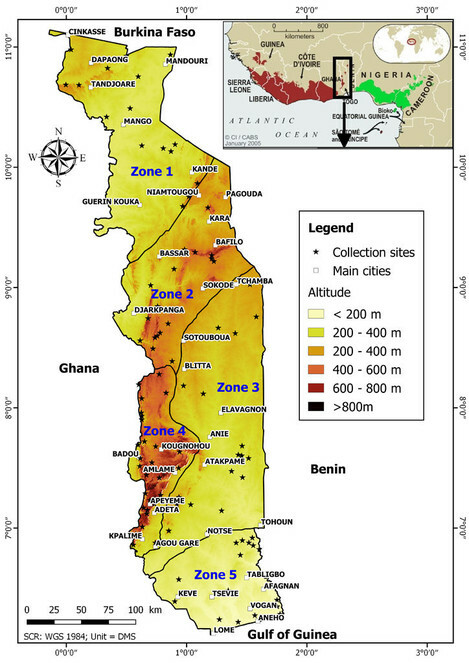 (2004) have highlighted Togo Mountains as a hotspot of diversity for Pteridophytes on the African continent. Nevertheless, apart from the works of Alston (1959) , Roux (2009) and Abotsi et al. (2015) , no other published taxonomic paper for Pteridophytes is available for the country. Moreover, those studies are still partial and cannot provide currently sufficient knowledge on the country. So, what is the current diversity of Pteridophytes in Togo? Available sources cite 61 species ( Alston 1959 ), 54 species ( Roux 2009 ) and even 126 species ( Fousseni et al. 2014 ). It is therefore possible that some or all of these data are not accurate, meaning that there might be additional taxa still unknown for the local or even global flora. Conversely, some taxa may have been mis-stated for the country. In the current era of the crisis of global biodiversity ( Teyssèdre 2004 ) and increasing deforestation in Togo ( Kokou 1998, Nadjombe 1992, Wilson et al. 2002 ) accompanied by a strong genetic erosion, it becomes more than urgent to know more about local biodiversity in order to draw the best conclusions for science and sustainable development. Species of great ecological, economic and/or genetic importance might be discovered and valued for the common good. The present study therefore aims to produce an exhaustive and reliable list of Pteridophytes from Togo, based on reference herbarium specimens collected throughout the country and the occurrence data available in the literature. This study covers the whole of Togo. Togo is a country in West Africa, covering an area of 56,600 km². Ecologically, the country is divided into 5 ecological zones, discriminated mainly on the basis of climate, vegetation and relief ( Ern 1979 ). The country usually has a humid to subhumid tropical climate, with rainfall ranges from 800 to 1600 mm per year. The country is crossed from south-west to north-east by the Atakora mountain range (also called Togo Mountains) which rises to 986 m at Mount Agou ( Fig. 1 ). The rest of the territory consists of alluvial plains covered by a fairly dense network of mainly temporary rivers. Study area (ecological subdivisions based on Ern (1979) and relief from SRTM2 scenes). The herbarium specimens of Pteridophytes kept in the Lomé Herbarium (TOGO; herbarium acronym following Thiers 2018 ) were used for this study. In total, there are 223 specimens, which are judged insufficient to support this study. To this end, it was critical to carry out new collections in the field. In addition, the occurrences available at GBIF.org (2016) online database and in the works of Roux (2009) and Alston (1959) were taken into account. Complementary specimens were collected throughout the territory between March 2013 and August 2017 by K.E. Abotsi. The collection sites ( Fig. 1 ) were chosen in order to increase the probability of encountering Pteridophytes and to cover the entire heterogeneity of the country. In all, 100 sites were selected in which collections were carried out, regardless of taxonomic affiliation. For each gathering, 1 to 4 duplicates were collected depending on the availability of fertile plant material and the state of the population. A fragment of lamina was also collected and preserved in silica gel ( Gaudeul and Rouhan 2013 ). Photos of the entire plant as well as close-ups for identification (fertile parts, venation, hairs, scales etc.) were taken to support the identification. A total of 869 georeferenced specimens were collected and are now kept in the Togo National Herbarium (TOGO). Duplicates were sent to the Herbarium of the National Museum of Natural History of Paris (P). Identifications of the newly collected specimens were carried out thanks to the reference specimens of TOGO and P herbaria ( MNHN 2017 ) as well as the flora of Cameroon ( Tardieu-Blot 1964 ), Benin ( Akoègninou et al. 2006 ) and Mascarene Islands ( Autrey et al. 2008 ). Species names were updated to follow the PPGI classification ( PPGI 2016 ), and considering synonymies included in the literature or Tropicos ( Missouri Botanical Garden 2018 ) or Roux ( Roux 2009 ). The collected specimens were studied on the basis of morphological characters (vegetative and reproductive), adapted from the list of descriptors proposed by Abotsi et al. (2015) for the Pteridaceae family. Information on the ecology and geographical distribution has been reported directly in the field. The checklist is organised by suprageneric taxon according to the current classification ( PPGI 2016 ). Only 3 representative specimens examined were cited in the checklist to avoid overloading the text. The data underpinning the analysis reported in this paper are deposited at GBIF, the Global Biodiversity Information, http://ipt.pensoft.net/resource?r=togo_pteridophytes&v=1.1 ( Abotsi 2018 ). The dataset contains only new occurrences recorded during this study. Prior occurrence data from other collectors are already available at GBIF portal. Abotsi, K.E., Sodjinou E. & Mingou P.
Crepidomanes minutum (Blume) K. Iwats. Osmunda hilsenbergii Hook. & Grev. Asplenium inaequilaterale Bory ex Willd. Asplenium variabile var. variabile Hook. Asplenium variabile Hook. var. variabile Hook.